Ever seen those videos where someone puts a baby tooth in a glass of soda and watches it decay? Well, the effect of soda in an actual mouth is a bit different. You have your saliva to help wash away the sugar, you eat other things throughout the day, and brush at least twice a day to remove debris or plaque. and excrete acid, which is what causes tooth decay. The more sugar our teeth have to interact with, the more prone to decay they will be. acids such as phosphoric acid or citric acid. Some people like to drink sparkling water thinking its better for them. It is better but the carbonation still produces carbonic acid which is harmful to teeth. Acid eats away at a tooth’s enamel and leaves it prone to decay. Caramel color, Yellow 5, etc. Any type of artificial coloring can cause tooth-staining. 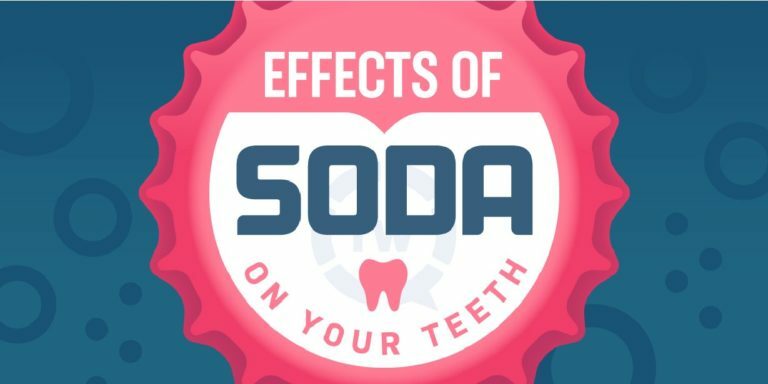 If you prefer your teeth sparkling white, it’s best to stay away from soda. Instead of soda, we recommend spicing up your daily beverages with other alternatives. How about some water infused with fresh fruit? with regular brushing and flossing to protect those precious teeth! If you want to know more about this ask Mary, Bridgette or Jaclyn at your next teeth cleaning appointment! Call us to get scheduled at (425) 774-5596.